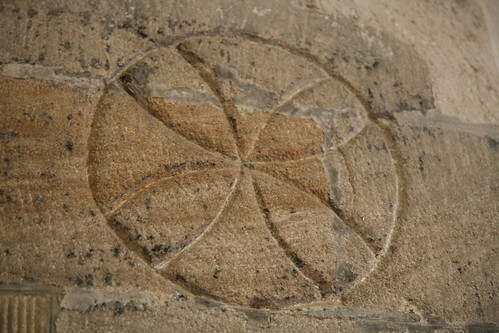 I recently discovered a Flickr group for Consecration Crosses. 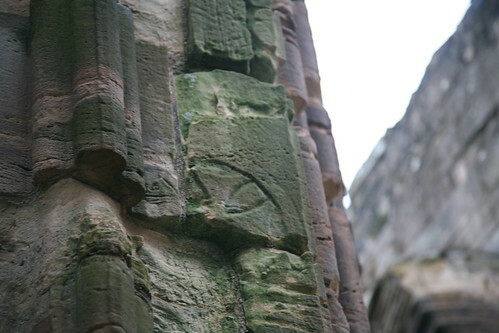 Found on the perimeter interior walls or columns of many ancient churches, particularly in extant examples in Northern Europe, these crosses mark the points where the building was anointed at its dedication. 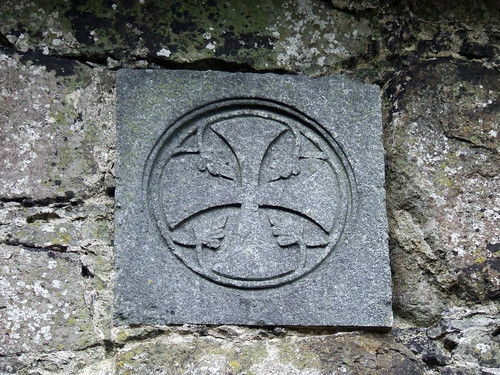 By common convention, their number and placement also symbolize the support of and solidarity with the twelve apostles. Like many elements in church design, the term "consecration cross" has different meanings if defined based on its form or its use. In most of the reference sources from art and architecture, it is the formal definition that takes precedence even when the function is later described. Read, for example, this page with more information of the glyph. 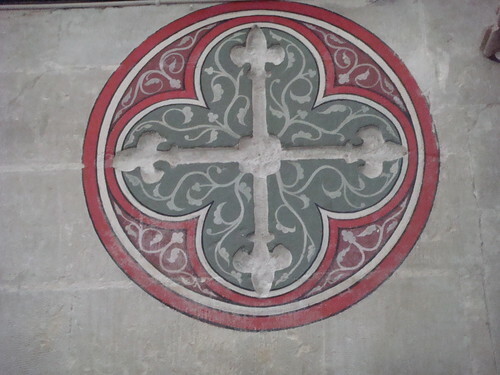 As a form "consecration cross" refers to a cross of equal arms wither rounded or inscribed in a circle. This is really more of a type than a form as infinite variations exist. However, the majority of recent examples I have come across, do not follow this form even as the symbolism and initial use remains. Their frequency seems to be increasing, and in many modern churches they are one of the few consistent symbolic elements. In their current usage they combine a high potential for graphic and/or sculptural design, a non-figural but still symbolic content, the perfect scale for hand-crafted pieces, a serial composition to unify a large space without extravagance, historical significance and continuity, and a clear derivation directly from the rituals for the building itself. The accommodation of a candle with each heightens the effects. It is little wonder the tradition remains vital, and they should be carefully considered in every project. 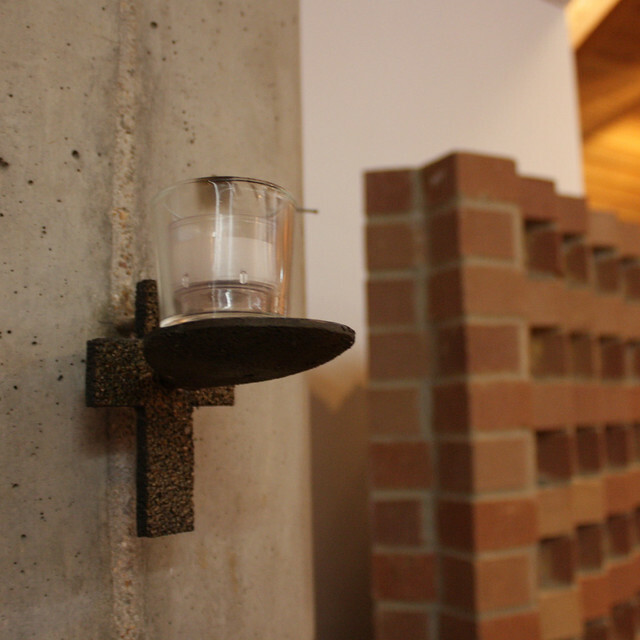 Defined based on its function, the consecration cross fixes and memorializes the ritual action of anointing the walls of the church. One example of current usage, which seems to be coming into greater practice, comes from the Roman Catholic Rite of Dedication of a Church. The rite places emphasis on the association with an attached candle. 16. The anointing of the church signifies that it is given over entirely and perpetually to Christian worship. In keeping with liturgical tradition, there are twelve anointings, or, where it is more convenient, four, as a symbol that the church is an image of the holy city of Jerusalem. 22. 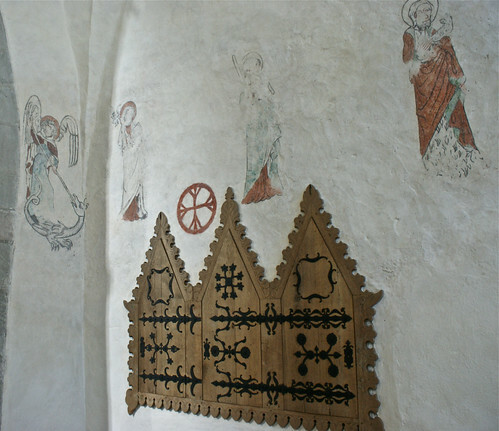 It is praiseworthy to keep the ancient custom of hanging on the walls of the church crosses made of stone, brass, or other suitable material or of having the crosses carved on the walls. Thus twelve or four crosses should be provided, depending on the number of anointings (see no. 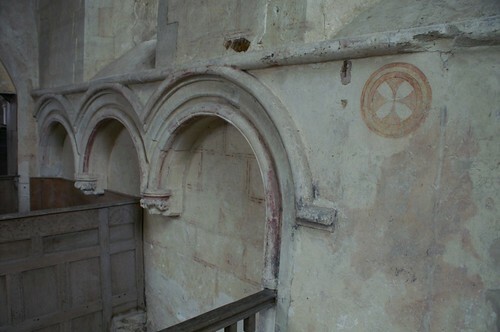 16), and fixed here and there at a suitable height on the walls of the church. 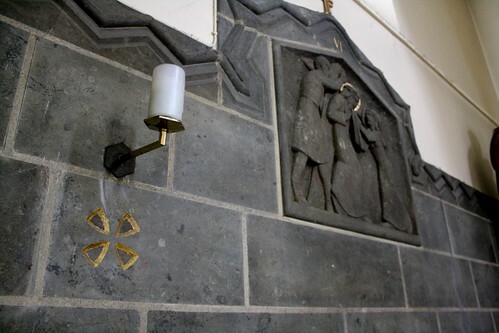 Beneath each cross a small bracket should be fitted and in it a small candlestick is placed, with a candle to be lighted. One of my long-term projects is a dictionary of elements of church environments with a clear distinction between derivation from their form or their use. This will give preference, when appropriate, to the liturgical functions rather than the formal or symbolic basis found in architectural and religious works respectively. Some terms derived from use have passed onto the form (or vice versa) and this history makes a considerable difference in understanding historical sources and current directives. Focusing on the more subjective or culturally-specific symbolic aspects only further complicates the matter. The work becomes even more complicated by differences in terminology between denominations and ecclesial traditions. But use as an organizing principle would start from a commonality of practice (and archetypal actions and forms) followed by development into variations. Clearly from this instance, both form and use are essential aspects of the continuity of a liturgical artifact. 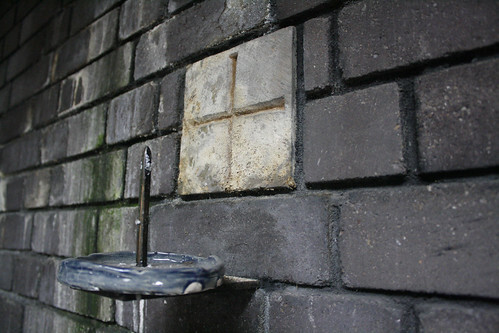 Though the details of when and where they have applied needs to be flushed out. Much of the issues I find with discussions of form and symbolism in churches is that every statement appears to be a definitive universal one. (A forthcoming post will address these issues in common church parlance more thoroughly.) This brief post does not have enough research to support a full exposition of the consecration cross, but I have tried to at least give some contextual pointers (historical, cultural, geographical, denominational) in my statements to avoid this all-too-easy pitfall.